Blessed Anne Catherine Emmerich was born “Anna Katharina” into a family of poor farmers and had nine brothers and sisters. She was expected to work around the house and farm at an early age. Her schooling was short, but all those that knew her noticed that she felt drawn to prayer from an early age. At the age of twelve, she started to work at a large farm in the vicinity for three years, and later learned to become a seamstress and worked as such for several years. She applied for admission to several convents, but kept getting rejections because she couldn’t afford a dowry. Eventually the Poor Clares in Munster agreed to accept her, provided she would learn to play the organ. She went to study music and learn to play from the Sontgen family, and one of their daughters would enter the convent with her, with not the Poor Clares, as poverty kept them from affording an organ. The two of them finally joined the Augustinian Nuns in 1802 at the age of 28. She became known for the strict observance of the order’s rule, but from the beginning she was ill and had to endure great pain. Her zeal and strict observance of the rules puzzled some of her Sisters, because of her health and religious ecstasies. King Bonaparte suppressed the Convent in 1812, and Anne Catherine found refuge in a widow’s house. While there, the sick and poor came to her for help. According to her contemporaries she “supernaturally” knew what their diseases were, and prescribed cures. In 1813, Anne was confined to bed and received the stigmata. An Episcopal Commission examined her life and claims regarding her miraculous signs. The Vicar General, the Overberg, and three physicians conducted the investigation. They were convinced of her sanctity and the genuineness of the stigmata. After five years, in 1818, God granted her prayer to be relieved of the Stigmata, and the wounds in her hands and feet closed but the others remained open. On Good Friday, all of her wounds were opened. In 1819, Anne Catherine was investigated again, this time by secular authorities. She was forcibly removed to a large room in another house and kept under strict surveillance day and night for three weeks, away from her friends. As a child, she had visions, in which she talked with Jesus. She had seen the souls in Purgatory, and that is whom she prayed for. She was also shown the core of the Holy Trinity in the form of three concentric interpenetrating full spheres, the biggest but less lit sphere represented the Father core, the medium sphere the Son core, and the smallest lit sphere the Holy Spirit core. Each sphere of omnipresent God is extended toward infinity beyond God’s core placed in Heaven. Anne Catherine began to grow ever weaker during the summer of 1823. She died on February 9, 1824 in Dulmen and was buried in the graveyard outside the town. A large number of people attended her funeral. He grave was reopened twice in the weeks following the funeral, due to a rumor that her body had been stolen, but the coffin and the body were found to be intact. In February 1975, her remains were moved to the Holy Cross Church in Dulmen, where they rest today. One of Anne Catherine’s visions, which can be found in “The Life of the Blessed Virgin Mary” were used in the discovery of the “House of the Virgin Mary”. Ephesus had not yet been excavated, but Anne Catherine wrote her visions down, describing the house of the Blessed Virgin Mary before her Assumption into Heaven. It was located on a hill near Ephesus. In 1881, a French Priest Julien Gouyet used Anne Catherine Emmerich’s book to search for Mary’s house in Ephesus, and he found it based on the descriptions. He was not taken seriously at first, but Sr. Marie de Mandat-Grancey persisted until two other Priests followed the same path and confirmed the finding. As of this time, the Holy See has taken no official position on the authenticity of the location yet, but in 1896 Pope Leo XIII visited the site, and in 1951 Pope Pius XII initially declared the house a Holy Place. Pope John XXIII later made the declaration permanent. Pope Paul VI in 1967, Pope John Paul II in 1979 and Pope Benedict XVI in 2006 visited the house and treated it as a Shrine and Holy Place. On October 3, 2004 Pope John Paul II beatified Anne Catherine Emmerich. She was beatified solely on the basis of her own personal sanctity and virtue. 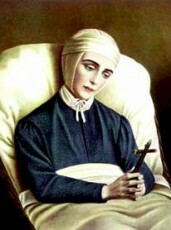 Blessed Anne Catherine Emmerich was born into a large and poor family. She had to work the farm at an early age. She was drawn to the religious life and eventually joined the Augustinian Nuns. She had visions as a child where she talked with Jesus. She had supernatural insight when working with the sick and poor. She also had the stigmata. She was a model of heroic virtue for her contemporaries, and for us today. One of her visions led a Priest to discover Mary’s house in Ephesus, which at that time, Ephesus had not yet been discovered. Several Popes have visited the house discovered and thought to be Mary’s, and Pope John Paul II beatified her in 2004.